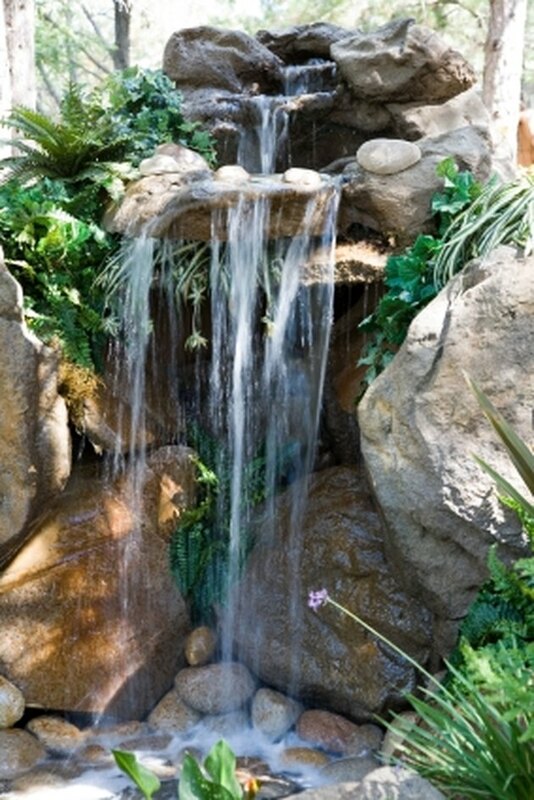 A backyard pond waterfall can be a beautiful addition to your backyard pond and garden. If you do your homework and due diligence, installing your waterfall will be the easy part. Carefully design your waterfall ahead of time. Know the length, width, expected depth of any streambed and the height above the pond's surface for the origin of your waterfall before you build. Measure the length of hose you will need to travel from the top of your waterfall down into the bottom of your pond. Make the slope from pump to waterfall as gentle as possible but also as short as possible to avoid needing a more powerful (and expensive) pump. Install your spillway. The larger the spillway of your waterfall, the more power your pump will need to push water over it. A smaller spillway will be less expensive to operate. You can purchase pre-made waterfall weirs for the spillway reservoir or create your own. Line any streambed with rubber pond liner material before arranging substrate over it. This will avoid your pond's water being absorbed into the ground under the waterfall instead of being returned to the pond. Arrange your substrate material. You can use any non-porous material to decorate a waterfall. Rock is traditional, but you could also use masonry, ceramic pipes or tiles, glass or even metal. Copper is not ideal for a pond with fish. Calculate what size pump you need to propel the water from the pond surface to the top of your waterfall. Expect your pond waterfall pump to circulate the entire volume of your pond every hour. Height above the pond surface and distance the water needs to travel through the piping will both increase the needed gallons per hour (GPH) capacity of your pump. Retailers selling pond and fountain pumps will be able to assist you in finding the appropriate size. An easy way to determine the GPH needed is to run a garden hose at the top of your waterfall at the flow of water you prefer. Channel the flow into a container and divide the container's volume by the amount of time needed to fill it. Purchase the pump. Submersible and non-submersible pumps are on the market for backyard pond waterfall systems. Consumers must weigh reduction of pump noise against ease of maintenance. Install the pump in your pond according to manufacturer's instructions. If using a submersible pump, be sure to elevate the pump above the bottom of the pond to avoid accidentally pumping all water out of the pond, in the case of a malfunction or leak. Connect flexible ridged hose pipe to both pump and top of waterfall. Secure the connections with hose clamps. Hide your piping however you wish. Burying the pipe is more aesthetically pleasing but will make leaks more difficult to detect or repair. Connect the pump to electricity. Be sure to use a ground fault interrupter circuit. A former zookeeper turned writer and copyeditor in 2006, Kelly Schaub has published dozens of non-fiction articles on pet care and other topics. Schaub is a member of Willamette Writers, the Editorial Freelancers Association, and Romance Writers of America. Schaub earned a Bachelor of Science degree in Zoology from Oregon State University and edits fiction professionally.